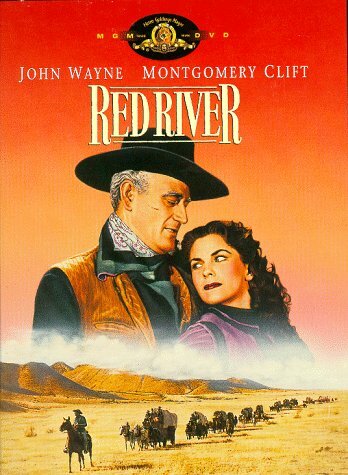 Red River, humorously referred to as a ‘cow opera’, remains a gripping Western, if not for anything else, for its breathtaking scope and audacity. Its themes of gargantuan human ambitions, male ego, masculinity and father-son duality, with Biblical overtones and veiled commentary on the stomping march of capitalism, were accentuated by an alternately classical and revisionist Western framework. It was also the first time that the two quintessential American icons, Howard Hawks and John Wayne, teamed up. The film begins with Tom Dunston (Wayne), a searing individualist, breaking out from his group to start his own cattle ranch. Many years later, with the economic slowdown brought on by the Civil War, he plans to take his herd of around 10,000 cattle nearly a thousand miles across the country, from Kansas to Texas, in the search for a better beef market. Joining him, among others, is Matthew Garth (Montgomery Clift), his surrogate son. With the cattle drive, at once the height of human ambition and the depth of human folly, began a jaw-dropping odyssey that was as much physical as it was psychological in the way it brought out the worst in Dunston and the best in Garth, and tested the limits of all. And when Garth eventually rebels against the increasingly draconian Dunston, after a spectacularly staged stampede, darker dimensions got added to the epic and tense narrative. The happy resolution of the conflict was perhaps the sole blemish of this masterpiece. Wayne’s powerful turn as the bitter, dictatorial and imposing anti-hero would rank as second only to his superlative performance in Ford’s The Searchers. A phenomenal film, but only a warm up to possibly the greatest of all Westerns Rio Bravo. Rio too was a marvelous Western alright, though I'd rate the film it was made as a response to, viz. High Noon, as an even better Western. I Would rate this as Wayne's best and may be searchers will only next to this. The dialogue which wayne mouths when he says to his son: that i will find you & kill you is still spine chilling. Rio Bravo will come possibly at 3rd place after these 2 master piece films. P.S: High noon , well lets talk about it sometime later on. not to spoil the mood of this post. You may recall Shubhajit, that this film was the one being watched by Duane and Sonny in one of the last scenes in Peter Bogdonovich's elegiac masterpiece THE LAST PICTURE SHOW. You have framed the thematic content superbly, and certainly it's a benchmark of the genre, revered for all it's components and as a further example of Howard Hawks' diversity. It's true that it's one of Wayne's banner performances, and I'd add that Russell Harlan's black and white cinematography is richly picturesque, and Dimitri Tiomkin contributes a memorable score. Wayne's performances in both the films were powerful and had darker shades. So I guess it boils down to personal preferences. Personally, I'd keep only Wild Bunch at same or similar level with Searchers. But, that said, all these are great films, and at the end of the day that's all that matters. Yes, I do remember that moment in The Last Picture Show. This is indeed a masterpiece of the genre. And, as you aptly observed, the cinematography & the score, too, do deserve mention. Thanks a lot Sam for sharing your love for this film.